With powerful performance and versatility to push applications like Adobe and Autodesk to the limit, the 14" ZBook x2 G4 Multi-Touch 2-in-1 Mobile Workstation from HP helps turn your vision into reality. Thanks to the flexibility of a backlit Bluetooth keyboard, you can switch from laptop to tablet mode at a moment's notice, while six HP Quick Keys provide shortcuts for your favorite apps. Even when detached, the keyboard stays active, and an included ZBook x2 pen, which requires no power source, enables precise control through 4096 levels of pressure sensitivity, low latency, and tilt support. This ZBook x2 features a 10-bit (8+2 FRC) 14" UWVA IPS anti-glare display with a UHD 4K 3840 x 2160 screen resolution, support for up to 1 billion colors, LED backlighting, a 16:9 aspect ratio, 300 cd/m2 brightness, a 300:1 typical contrast ratio, a refresh rate of 60 Hz, 283 ppi, and viewing angles of 85/85/85/85°. The display also features multi-touch functionality, allowing you to utilize the touch gestures and functions in Windows 10 Pro to further improve accessibility and productivity. The dedicated NVIDIA Quadro M620 graphics card has 2GB of discrete GDDR5 RAM and delivers a sharp, clear picture. You'll be able to output video to an external display at resolutions up to 5120 x 2880 using the system's HDMI 1.4 and dual Thunderbolt 3 ports, the latter of which supports DisplayPort 1.2. This system is powered by a 1.6 GHz Intel Core i5-8250U Quad-Core processor, which allows you to run multiple applications simultaneously. If you need more power, the system can be overclocked to 3.4 GHz using Intel Turbo Boost 2.0 technology. The 8GB of 2133 MHz DDR4 RAM helps to ensure smooth multitasking and also allows the computer to quickly access frequently used files and programs. For storage of your files, this ZBook x2 is equipped with a 128GB SATA III M.2 SSD. If you want to add external storage, optical drives, memory card readers, and more, the ZBook x2 offers two 40 Gb/s Thunderbolt 3 ports that also support 10 Gb/s USB 3.1 Gen 2 Type-C. There is also one 5 Gb/s USB 3.1 Gen 1 Type-A port that doubles as a charging port. 802.11ac dual-band Wi-Fi and NFC are built-in for wireless networking, and Bluetooth 4.2 technology will also allow you to connect additional compatible peripherals. Content from memory cards may be accessed via a built-in SD/SDHC/SDXC card reader and other integrated features include a user-facing 720p IR webcam for face authentication with Windows Hello, a rear facing webcam that supports 8MP stills and 1080p / 30 fps video, dual-array microphones, stereo speakers with Bang & Olufsen HD audio, and a smart card reader. 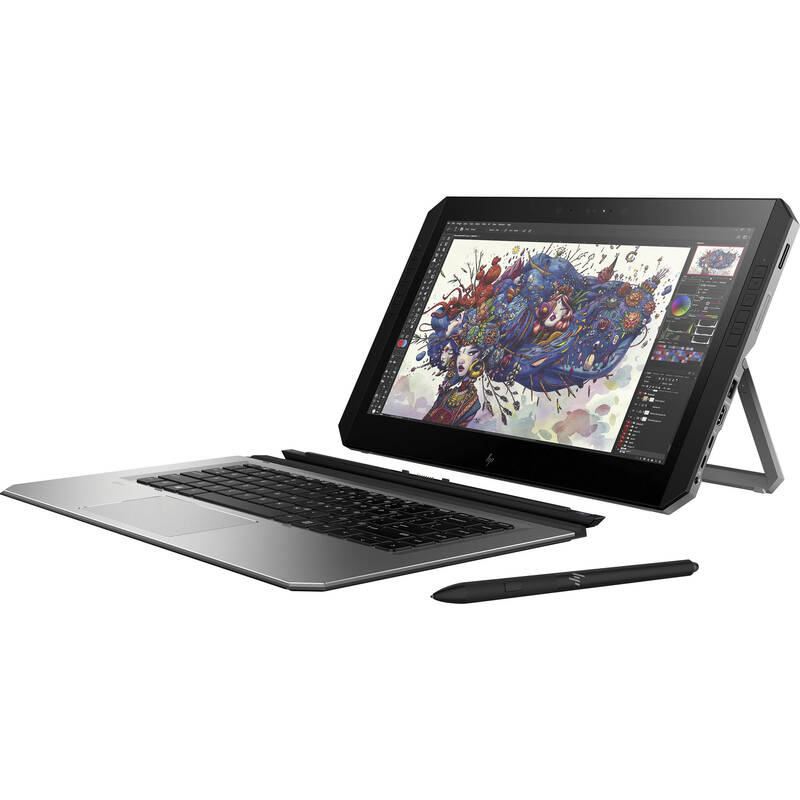 HP's ZBook x2 G4 includes a 90W AC adapter that supports HP Fast Charge and operates using 90-265 VAC at 47-63 Hz, plus an HP Long Life 4-cell / 70Wh lithium-ion polymer prismatic battery that lasts for around 10 hours before recharging is required, and typically recharges in 3-5 hours. The installed operating system is Windows 10 Pro (64-Bit) and also included is recovery media and an Elite Services card. Work with high resolution files and switch between applications like Adobe Photoshop and Illustrator. Create effortlessly with a 1.6 GHz Intel Core i5-8250U Quad-Core processor, 8GB of 2133 MHz DDR4 RAM, and dedicated NVIDIA Quadro M620 graphics with 2GB of GDDR4 memory. With the flexibility of a detachable Bluetooth keyboard, you can go from laptop to tablet whenever inspiration strikes. Plus, customizable HP Quick Keys provide 18 time-saving shortcuts for your favorite Adobe apps. Create without interruption using an included ZBook x2 pen that never needs to be charged. It responds instantly to the nuances of your hand with 4096 pressure sensitive levels and natural tilt capabilities. This ZBook x2 features a USB 3.1 Gen 1 Type-A port that will allow you to connect external peripherals such as additional storage, optical drives, printers, memory card readers, and more. This port also doubles as an always-on charging port for compatible USB devices. Near-field communication (NFC) is a set of communication protocols that enable two electronic devices, one of which is usually a portable device such as a smartphone, to establish communication by bringing them within 1.6" of each other. NFC devices are used in contactless payment systems, similar to those used in credit cards and electronic ticket smartcards, and allow mobile payment to replace/supplement these systems. NFC is used for social networking, as well as for sharing contacts, photos, videos, or files. NFC-enabled devices can also act as electronic identity documents and keycards. NFC offers a low-speed connection with simple setup that can be used to bootstrap more capable wireless connections. The ZBook x2 supports multiple displays in several configurations. Using Thunderbolt 3 and the ZBook Dock, up to five independent displays are supported, which include the internal panel plus four external displays. When using just Thunderbolt 3 and no ZBook Dock, up to three independent displays are supported (internal panel and two independent displays) and when using Thunderbolt 3 with DisplayPort 1.2 Multi-stream Transport (MST) and no ZBook Dock, up to five active displays are supported. Box Dimensions (LxWxH) 19.0 x 14.0 x 6.0"